Many children do not enjoy daily standard face-to-face contact with both of their parents. This is particularly true for separated and divorced families who no longer live together 24/7. In recent years, parents and courts have made frequent use of various technology in family law as a means of connecting. In this post, I will look at parents and kids staying in touch via virtual means, such as Skype. Separated parents living in the same city as their children use Skype as a way to reach out to their children. In these circumstances, the parents seek traditional visitation with their children as well as virtual visitation. 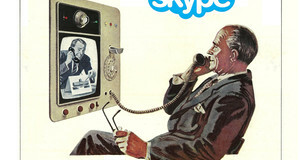 Skype access is used as an add on to actual time spent together. What is more controversial is that Skype is now often proposed as a way of maintaining the relationship when a parent relocates, either with or without the child. Parents seeking either permission or a court order allowing a move hold out daily Skype access as a way of ensuring the non-moving parent and child have regular contact. From across the country, parents can assist their children with their homework, e-mail photographs, play games, chat about their days, and even tell knock knock jokes. But does Skype access work? Do parents and children who primarily visit via Skype feel that it maintains or improves their emotional connection? There is some research that seems to indicate that parental involvement is self-reinforcing i.e. the more virtual contact a parent enjoys, the more in-person contact s/he will want. If this is true, then virtual visitation can be seen as good for children, since kids are known to do better when both of their parents are involved in their lives. Judges allowing a parent to move with the children seem to accept that electronic communication is not as desirable as in-person access, but propose it as the next best thing. Skype does allow for the child to keep in touch with the non-moving parent as much as every day. Although supporters believe that Skype allows parents to connect and to share spontaneous moments with their children, you can’t hug a child through the Internet. There is presently an Ontario study underway that will shed some light on how virtual visitation is working in this province. Until the study is published, however, parents and judges are going to have to evaluate Skype access for themselves. An agreement or order providing for virtual visitation should be extremely detailed. It is not only the nuts and bolts of the device that have to be considered. There is a lot to think about. The following are just some of the issues to keep in mind. a) How and when the necessary Technology in Family Law is obtained and set up. A computer, internet access, a web camera and email are all required. Such systems can be costly. b) Specify the required level of quality of the Internet access. A DSL line or greater quality bandwidth is needed. c) Who pays for it? It may be appropriate for the moving parent to cover the cost of providing an appropriate computer, a service plan and to be responsible for reasonable computer costs, including monthly DSL and Internet service for a specified period. a) The duration of the access has to be age and developmentally appropriate. A three year old has a brief attention span and should not be expected to sit and interact for thirty minutes at a time. A teenager might be able to hang out for longer, listening to music and doing homework with the non-resident parent. Know your child and his or her needs. b) Make the Skype access enjoyable. It should not be a chore. This requires effort from both parents: the non-resident parent should make the access meaningful and the resident parent should encourage and support the access 100%. a) Time the access so that it works with the child’s schedule. Don’t book a visit first thing in the morning if your child is not a morning person. Don’t schedule access at dinnertime. Don’t insist on a call at 7:30 pm if that is when your daughter’s favourite TV show is on. It will just lead to problems. Be sensitive to what your child has to do during the day and what he or she would like in terms of access. b) Know what your ex-spouse thinks is a good or bad time, since he or she will either facilitate or discourage the contact. Choose a mutually convenient time, so that you and your child are sure to be able to focus on and communicate with each other. c) Make sure that the Skype visits are a priority to everyone involved. They should be a staple of the week, a fixed part of the daily routine like meals or bedtime. This tip goes hand in hand with scheduling the access at a time that makes sense. As set out above, you are more likely to get regular access if it is at a time that works for your ex-spouse, you and the child. d) Set a Skyping schedule. Just like in person visits, Skype access should take place on fixed dates and at set times. You will not be able to maintain and develop a relationship with a child who is miles away if you speak only when the two of you can catch a moment to do so. The access does not have to be the same time and duration every day, but it has to be on a schedule. Weekday visits may be shorter and weekend longer, for example. e) Build in some flexibility. Emergencies come up and there has to be a mechanism for rescheduling. Be understanding of special occasions that may come up for your child which trump the call. Susie shouldn’t have to miss her friend’s birthday party for Skype, when a call at another time can be arranged or she will resent you. Be sure Johnny knows he can Skype you if he scores a goal in the big game, even if it isn’t a day to chat. Parents tell me that these ad hoc calls are essential, as they are what make the relationship more real. a) In order for the child to feel comfortable, Skyping with the non-resident parent should take place in private. Technology in Family Law should be in a place that’s comfortable for the child. The child should feel free to have his or her own personal relationship and communication with the non-resident parent, without fear of the other parent listening in. b) Parents should not use the chats as an opportunity to try to get information about each other. c) Parents should not use the child to communicate any issues related to the divorce. Given the complexity of the issue, and the various terms you will want included in any agreement for virtual visitation, you should consider consulting a family law specialist for assistance.